Before you start making cabled yarn, you need to gather some supplies. You need your hand spindle with a leader attached — use the heaviest spindle that you have, and two balls of your handspun two-ply rolled into two center-pull balls. It is also helpful to have a weighted hook, transparent tape, and a handful of brass washers that can fit on your hand spindle. The trick to making a yarn cable simple—it needs to be very over-twisted. By re-plying, you double the twist in your plied yarn. 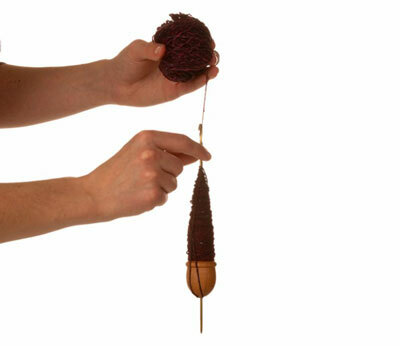 Attach the center-pull end of one of the balls to the leader of your hand spindle. Turn the spindle to the left, in the same direction that you plied the yarn. Use your weighted hook to check the twist. It should fly around as the twist snaps the yarns together. Check the yarn sample. It should have a braided surface and hang in a perfect, balanced loop. If it does not do this, you should re-ply it again. It may take several more tries to give the two-ply the twist that it needs to cable. Finish re-plying the two-ply ball. 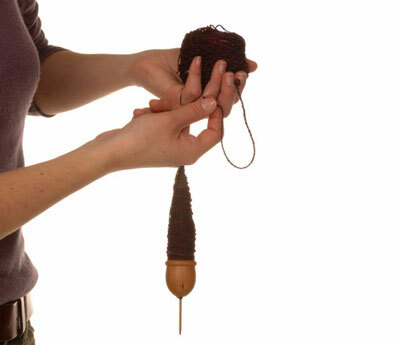 Tie the end of the plied yarn in a knot, and wind it back into a center-pull ball. Tape the end of the yarn to the ball. Be careful not to drop or let go of this end — the twist can run out just like spilt water. Repeat this same process with your second ball of two-ply yarn. To add weight to a hand spindle, slip a few washers over the shaft of the spindle. 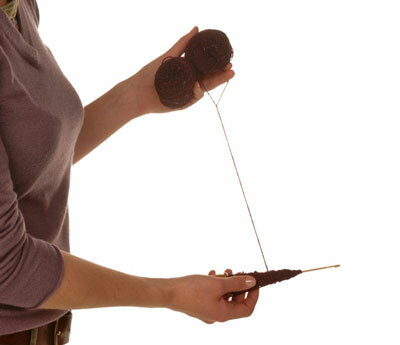 Attach the ends of both balls to the spindle leader with an overhand knot. Hold the yarns in your fiber hand, and pull out a foot of each of the two yarns with your spinning hand. Give the spindle a twist to the right with your spinning hand. Slide your hand back up the yarn to help guide the twist evenly into the yarn. It should take very little time for the two yarns to snap together, as cabling is much faster than plying. 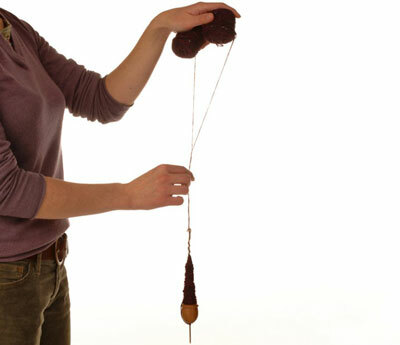 Pull out another foot and repeat the same process until you have used up the two balls, stopping to wind the finished cabled yarn onto the spindle shaft when you have reached the length that you can spin. Remember to keep as much weight near the base of the spindle as possible, just as you did when you spun the single or plied your yarn. Wind the yarn into a skein and wash it in hot, soapy water.